Why do we brush our teeth? The answer to this question may be central in addressing our nation’s most pernicious healthcare issue — chronic disease. According to the CDC, “chronic diseases and conditions — such as heart disease, stroke, cancer, type 2 diabetes, obesity, and arthritis — are among the most common, costly, and preventable of all health problems.” Drilling down into just one of those chronic conditions produces a host of shocking statistics: Nearly one in ten people in the U.S. has diabetes. Of those, nearly a quarter aren’t aware they have it. Further, about a third of the population has prediabetes. The lifetime risk of diagnosed diabetes is approximately 40 percent for U.S. adults. 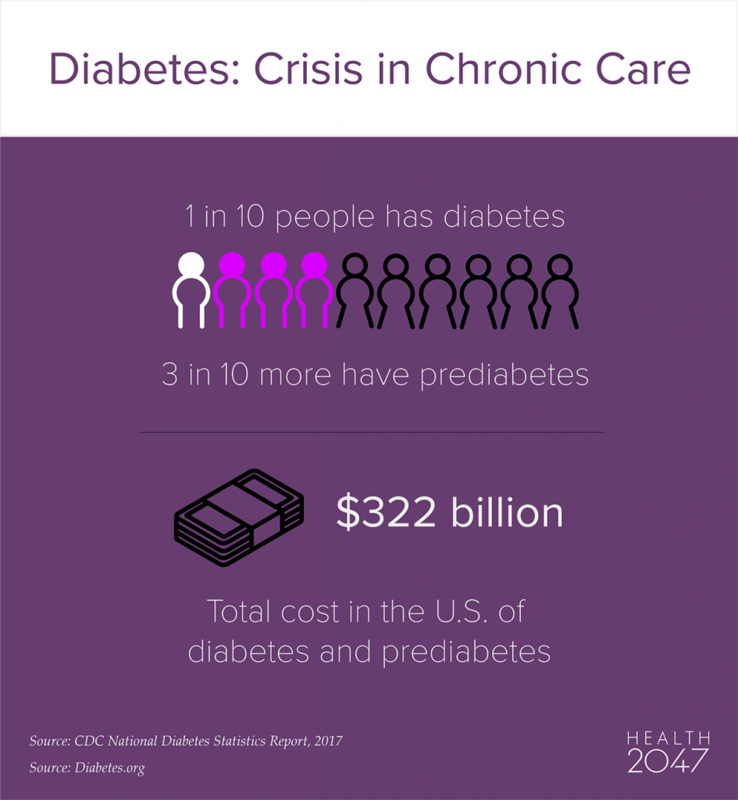 The NIH noted a 41% increase in costs associated with diabetes between 2007 and 2012, culminating in an estimated $245 billion annual price tag ($176 billion in direct medical costs and $69 billion in reduced productivity). Whatever we’re doing to stem this crisis, it isn’t working. Our existing healthcare system was built to meet the demands of acute and episodic medical needs (treat and release). It is great for healing injury, but is quite obviously ill equipped to stem the proliferation of chronic conditions. Simply throwing more money at more-of-the-same isn’t going to help. As this crisis continues to intensify, we must find a way to address conditions via continuous models that require the patient to be more involved, more proactive, working in a partnership with the doctor. Such a paradigm shift requires reimagining the structure of our system and refocusing on what we’re trying to accomplish. We don’t need more chronic care, we need less chronic disease. And here is where the tooth-brushing question comes in. We all know that daily dental hygiene and regular use of fluoridated toothpastes can prevent tooth decay, gum disease, and a whole host of painful oral conditions and complications. But fear of the drill alone is not the primary motivation for why we, as a population, habitually brush our teeth. Twelve years ago, a study was run on prediabetes by the National Institute of Diabetes & Digestive & Kidney Diseases. DPP is an excellent and proven model for the treatment of chronic disease, but how do we make it scale? How can we take the impressive results from the DPP and achieve the same transformation on a national level? This is a central question in flipping the paradigm on chronic disease. The answer will not be one thing. Behavioral economics is well understood in the consumer products world — you must provide people with a benefit to get the behavior that you want. Application of such principles in healthcare, under the guidance of the doctor, can and will drive positive change — but they must be reinforced. Utilization of modern connected technologies to extend the range of motivational support mechanisms and personnel can help, but DPP showed we still need human contact and a sense of community to achieve sustainable change. People also need to feel a sense of agency and the recognition that individuals should not be defined by their diseases. In essence, we have to increase the role of the consumer in addressing chronic disease while designing a personal-care-promoting system that has medical knowledge behind it. And we have to make that personal care not only easily accessible, but habitual and attractive as well (fresh and kissable). The doctor has a key role in reversing chronic disease by diagnosing the disease, recommending helpful approaches and monitoring progress. Yet, such a transformation is not going to happen in the doctor’s office or in the hospital. This is where we see tremendous opportunity for extending the healthcare system into new frontiers. Consider all the things that you do on a regular basis (say, weekly) — the majority of those things that are not work-related are probably within a mile of your home. That’s where chronic disease prevention has to be taking place, that’s where it will become routine. Addressing the chronic care crisis is really about developing a personal empowerment framework within our healthcare system. At Health2047, we believe we can lead the way, and are collaborating with select innovators and visionary organizations to create an ecosystem capable of delivering a solution at scale.